This great recipe is provided by Fareen of Food Mama. I think the perfect accompaniment to any BBQ is some fresh naan made right on the grill. It’s pairs so well with chicken and beef and satisfies any carb lover. The best is when it’s piping hot and covered in butter. Yes please. We have tried many naan recipes over the years. Ones with yeast, ones without. Ones with yogurt and eggs. I think we have finally found a winner. I have made this version a few times and they turn out every time. 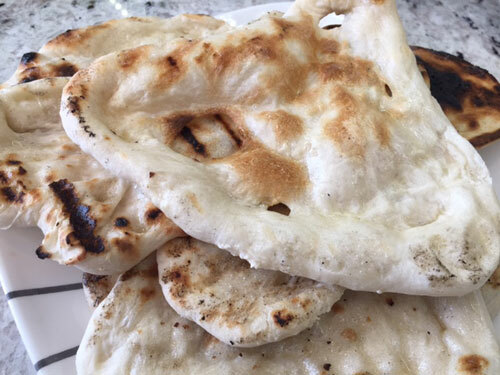 You don’t even need a tandoor to get soft and chewy naan. A bbq is all you need! They don’t take long, just put them on the grill for a couple minutes a side. I’m using this recipe from Food.com but changed up the instructions a bit. I always use a mixer to knead the dough – why do more work than you need to? I also liked the results better when the dough had a few hours to rise. If you have less than an hour though, you will still get great tasting naan. Combine the water, sugar and yeast in a mixing bowl and let sit for 5 minutes until foamy. Add salt and flour and turn the mixer on until the dough comes together into a ball. Place the dough in a well-oiled bowl and cover with a damp cloth. 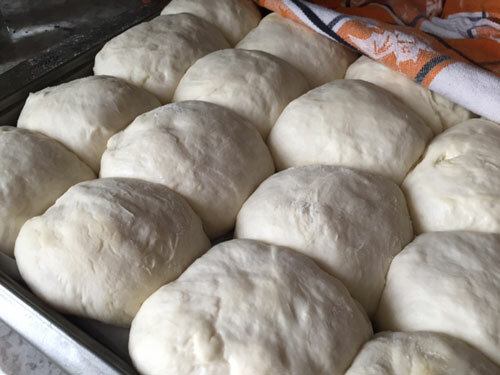 Place the dough in a warm place and let rise for a minimum of 45 minutes. More than a couple hours is ideal. After the dough has risen, punch it down and divide into 8 balls. Place on a parchment lined sheet and cover again with a damp towel. When ready to barbecue, roll the balls out and put them on the grill for a couple of minutes per side. Remove from the heat and spread butter on the hot naan. For more great recipes like this one, visit FoodMama.com.